Lana Turner was a film star almost better-known for her private life than for her films — and her films are pretty well-known. Discovered in Hollywood at a very early age, Turner was a successful "sweater girl" pin-up, who displayed serious acting chops. Born in the small mining town of Wallace, Idaho, Julia Jean's father was a miner. Nicknamed "Judy" she showed interest in perfoming from an early age, doing shows at her father's Elks Club meetings. Money seems to always been a problem, however. When the family moved to San Francisco in 1930, her parents split; her father John won some money one evening playing craps, and was robbed and murdered that night. Moving to Stockton, California, with her mother Mildred, Judy became a Catholic, and began considering taking Holy Orders. With Mildred developing a respiratory problem, the family moved to Los Angeles in 1936. While attending Hollywood High, Judy played hooky one day, and was enjoying a Coke at the Top Hat Malt Shop at Sunset and McCadden, when she was noticed by William Wilkerson, publisher of The Hollywood Reporter, whose office was nearby. He introduced her to now talent agent Zeppo Marx, who introduced her to director Mervyn LeRoy, who signed her to a contract and changed her name to Lana Turner. Whew! Turner's first film for Warner's was The Great Garrick (released in October, 1937). She wore a tight sweater before getting killed in They Won't Forget (released in October, 1937); after this, she was known as "the sweater girl" a nickname Turner detested. When her mentor Mervyn LeRoy left Warners to go work at Metro-Goldwyn-Mayer, Jack Warner told him to take Turner with him, since "she wouldn't amount to anything." Making her M-G-M debut as "the kissing bug" in Love Finds Andy Hardy (which played the Chinese in July, 1938), Turner was now seen as being the next Jean Harlow. After being sent to Dramatic School (released in December , 1938), she became a popular glamour girl with films like Ziegfeld Girl (which played the Chinese in April, 1941), the Spencer Tracy version of Dr. Jekyll and Mr. Hyde (played the Chinese in September, 1941), Honky Tonk (played in October, 1941), Johnny Eager (played in March, 1942), and Slightly Dangerous (played in April, 1943). 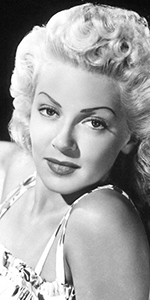 Lana Turner toured the country during World War II, selling War Bonds. Stops included a triumphant visit to her hometown of Wallace, Idaho. Turner's turning point came with her role in The Postman Always Rings Twice (released in May, 1946). The heavy part got Turner glowing reviews and the movie was a hit, so now more dramatic roles came her way: Green Dolphin Street (released in November, 1947), and Cass Timberlane (released in January, 1948). Very busy between these projects, she starred with Clark Gable in Homecoming (released in May, 1948), finally being directed by Mervyn LeRoy. Turner continued to have a full plate: The Three Musketeers (released in October, 1948), A Life of Her Own (released in September, 1950), The Merry Widow (released in September, 1952), and what might be her best film, The Bad and the Beautiful (released in December, 1952). The widescreen era opened with Turner starring in The Prodigal (released in May, 1955), The Sea Chase (released in June, 1955) with John Wayne, The Rains of Ranchipur (which played the Chinese in December, 1955) with Richard Burton; after Diane (released in January, 1956), M-G-M let Turner go from her contract. Now a free agent, Turner starred in the hugely successful Peyton Place (released in December, 1957), and was nominated for the Best Actress Oscar. Things were looking up. However, Turner's fourteen-year-old daughter Cheryl, fearing for her mother's life during a domestic fight, fatally stabbed her mother's lover, mobster Johnny Stompanato, at their home in Beverly Hills. Press interest in this affair almost ruined Turner's career. Producer Ross Hunter to the rescue. He placed Turner front and center in his remake of Imitation of Life (released in April, 1959). Sob-sister material was now Turner's stock in trade: Portrait in Black (released in July, 1960), By Love Possessed (which played the Chinese in June, 1961), Bachelor in Paradise (released in November, 1961), and Madame X (released in March, 1966). Turner was the star of the television show Harold Robbins' The Survivors on ABC in 1969, but it was cancelled after only 15 weeks. She guested on Falcon Crest in 1982-83, and The Love Boat in 1985. She published her autobiography Lana: The Lady, The Legend, The Truth in 1982. A life-long smoker, Turner was diagnosed with esophageal cancer in 1992. Chemo therapy helped, but the cancer returned, claiming her life in June, 1995 at the age of 74. Grauman's Chinese Theatre, Hollywood, California. Lana Turner Forecourt ceremony, Wednesday, May 24, 1950. 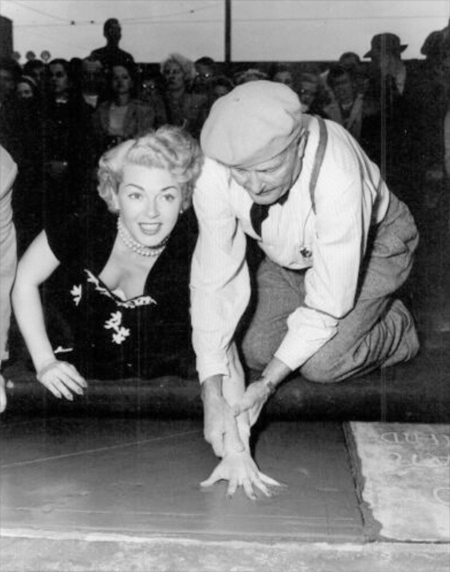 Theatre manager George Kane helps steady Lana Turner and cement artist Jean Klossner makes her shoe impression.